This is probably the first time that I recommend an application I have installed from the source code. Light-monitor is a lightweight system monitor that is very suitable for those who use Linux with an old computer. It is light on the system resources and depends only on X and Xft. 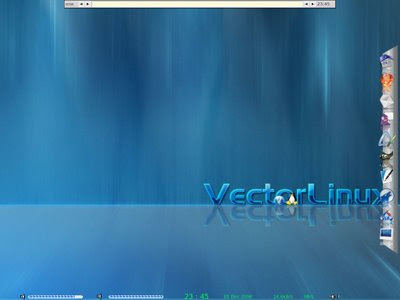 The Light-monitor was extremely easy to compile with Vector Linux. I just downloaded the .tgz package, untarred it (tar xvf light-monitor-v1.7.tgz), and compiled with make and make install. Of course, you need to have gcc installed on your system to compile the C source. Light-monitor can be seen in the bottom of the screen. On the right side, the OS X -like dock is wbar.